In our studies, we typically avoid imposing a definition on participants, allowing them to decide for themselves if they identify with the term, whatever it means to them. We present participants with lists of terms (e.g., furry, therian, otherkin, brony) and ask them to check off any boxes that apply to them. The result is a sample consisting of furries who do not identify as therians, furries who also identify as therian, and therians who do not identify as furries. Further breakdown of the data, such as that in the figure below,3 illustrate that the therians in our samples (e.g., online or at conventions) are 2-3 times more likely to not identify as a furry as they are to identify as a furry. It should also be noted that approximately 5% of respondents also identify as otherkin, a group comparable to therians, with the exception that the range of entities they identify with is broader and includes non-existent species/entities (e.g., dragons). 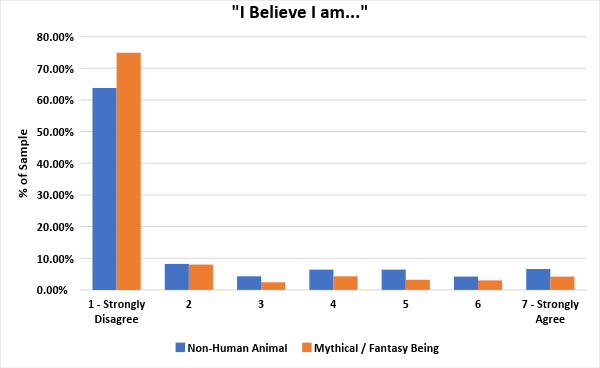 Given the possibility that a person may identity with a non-human animal species without knowing the term “therian”, we asked a number of questions to assess the prevalence of therian-related experiences within the fandom.6 In the figure below, which asks about therianthropy (blue bars) and otherkin (orange bars), it’s clear that the vast majority of furries do not have either of these beliefs, though more than 7% of furries indicate at least some degree of agreement with these beliefs. Below, we find that while most furries disagree with the idea that they are not entirely human, many do wish that they could become something other than human, even if that “something” is not entirely 0% human.